Today I took a somewhat odd trip to the Mekong Delta. I had presumed it would be a big bus tour with a bunch of folks from all over. Instead, it was myself, an Australian couple, our guide, and our driver, in a Sprinter. I’m not sure whether that was the intent of the tour or not, but it made for a pleasant tour. Our guide, Tim, was a real character, and enjoyed calling us his family. 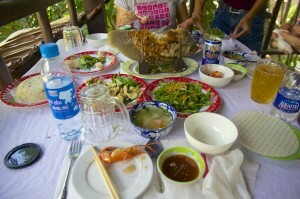 The Mekong Delta is about an hour and a half outside Ho Chi Minh City, and is the “bread basket” (rice basket?) for Vietnam. It’s incredibly fertile and supplies rice, fruit, vegetables – you name it – to the rest of the country. 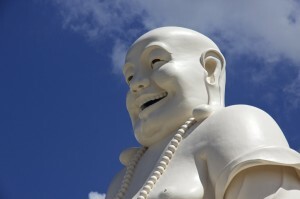 On the way, we made a brief stop at a Buddhist shrine to check out some Very Large Buddhas. They were built within the last few years (from concrete) and are, in fact, Very Large. 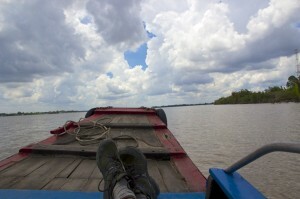 Onward to the Mekong. 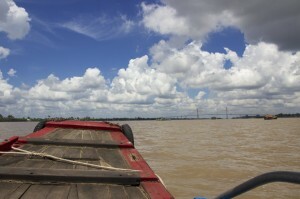 The Mekong is very wide (up to 4 kilometers), relatively shallow (from 12 to 30 meters), and very muddy. I imagine you could draw parallels between the Mississippi and the Mekong, but that’d be a bit too easy, wouldn’t it? We started out by taking a small motorboat to an island. As best I can figure, most of these islands are akin to the Caribbean islands owned by cruise ship operators. 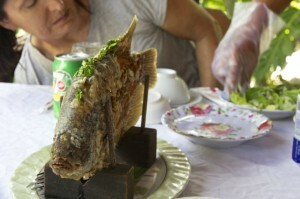 Their only reason to exist is so that tours can stop there for Authentic Mekong Experiences. Which is sort of fine with me, as long as everyone is on board. 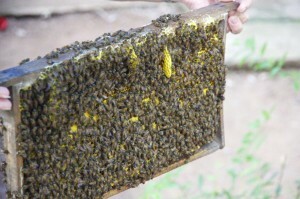 We sampled some dried fruit, some rather delightful bee pollen tea, and some of the honey produced on site. I held a bunch of bees. 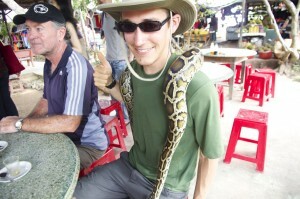 I also held a python. I can’t say I loved the python. Don’t trust snakes. Next, we migrated to another part of the island to sample various local fruits – jackfruit, dragon fruit, etc. As a Minnesotan, it’s easy to be overwhelmed by the abundance of fruit in this country. 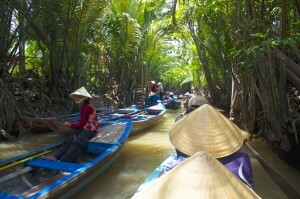 We transfered into small boats for a trip up a tributary, then got back in our motorboat to go to the Coconut Kingdom. This is another island, where they make Stuff Out Of Coconuts – candy, coconut milk, etc. The amount of effort involved in doing anything meaningful with a coconut probably provides insight into local labor markets. If you were Friedman or someone at least. Our next mode of transport was a horse-drawn wagon, which took us to lunch. Lunch in this case consisted of a rather angry looking river fish (I imagine he was angry even before he was cooked) and various accoutrements. Finally, another series of boats brought us back to the bus, and back to HCMC. A perfectly pleasant outing. It was fun to chat with the Aussies, and the tour didn’t have any high pressure “buy these trinkets!” sales lines. It was just a “hang out for the day, we’ll show you stuff, then bring you home” sort of deal. I can’t complain about that. Sounds like fun except for the snake and the angry fish.